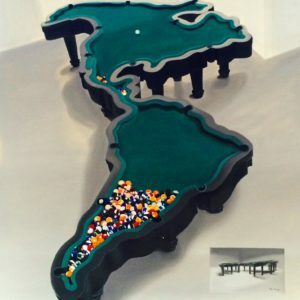 The – Merger is a collaboration group formed by the Cuban artists Alain Pino, Niels Moleiro, and Mario Miguel Gonzalez (Mayito). While Alain is graduated from the Visual Arts Academy at the University ISA, the other two – Niels and Mayito – come from self- taught backgrounds. They have been involved with the art world since very young, getting to the decision of merging their work in the maturity of their solitary careers. After many on and off collaborations in different collective projects and exhibitions, these three artists realized that working together was not only much more fun but they could also achieve much better results. Their debut took place during the X Havana Art Biennial in April 2009. For this first exhibit The-Merger group chose an underground show using its own studio as a gallery. Hundreds of artists, critics, gallery owners and art lovers passed by The-Merger’s head quarters during the opening day intrigued to know the result of the fusion of these three artists’ careers. The three artists have dabbled into different types of media. Sculpture is their tour de force and they have experimented with different materials such as black steel, stainless steel, bronze, aluminum, fiberglass, trans lucid silicone, murano glass, marble and wood. Each sculpture is preceded by several studies or projects, which are also works of art. For this purpose they have also worked with oil on canvas, acrylic on canvas, watercolor, gouache, drawings, serigraphy, photography, as well as with tapestry.